If you're looking for a country that knows a thing or three about beauty, look no further than Brazil. There are few places in the world where the daily beauty regime is taken so seriously. This alongside the country's phenomenal diversity might help explain why Brazilian women are so stunning. And in the process, I discovered a new beauty favourite: Natura. You may or may not have heard of this huge beauty conglomerate but it's the largest beauty company in Brazil. It's so big it recently bought out the UK's The Body Shop. It's popular throughout Latin America but has yet to gain as much fame on other shores, with the exception of France. 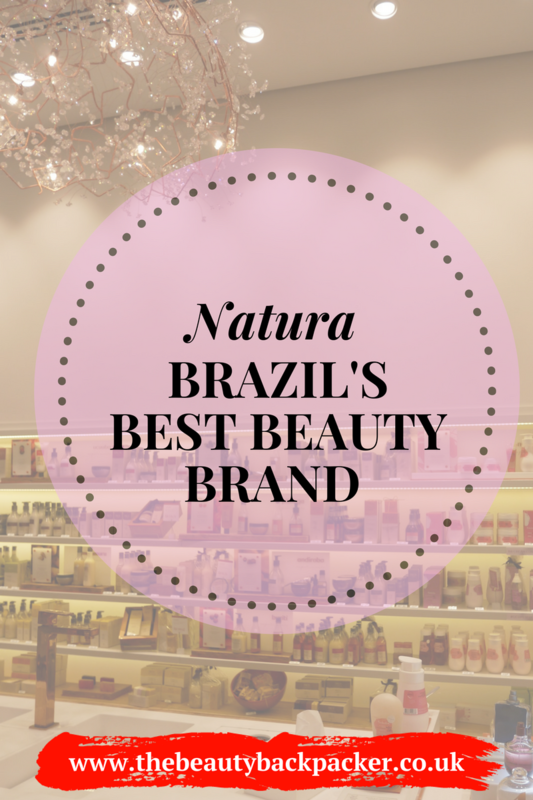 But judging by the sheer quality of Natura's products, it's big in Brazil for good reason and deserves more recognition across the globe. Natura shops are sleek and sophisticated with excellent sampling stations, just how every good beauty shop should be. I took advantage and tried a few of the soaps, some matte lipsticks and some skincare. I instantly fell in love. Natura sells an extensive range of beauty products, everything from skincare to haircare to makeup and perfumes. It also has a men's and a baby line. So it's literally a one-stop-shop for all your beauty needs. But what I love most about the brand is its commitment not just to sustainability but also to using local Brazilian ingredients. Local fruits, plants, seeds and more are incorporated into Natura's products. So you're not only trialling a new brand but also benefiting from the powers of flora unique to Brazil and Natura. Thanks to the brand I've discovered so many cool new beauty-inducing ingredients that I'd never heard of before. Take pataua oil, which is extracted directly the fruit of an Amazonian palm and whose natural properties help with hydration, ageing and softness. It's used in the brand's Ekos haircare line and the Natura Pataua hair oil has now become another staple in my curly haircare routine. And it smells absolutely divine! Plus, at about £13 for the bottle it's reasonably priced in comparison to high-end hair oils in the UK or the US. The rest of the Ekos line is also worth checking out with its range of 10 different local ingredients including açai, passionfruit, Brazil nuts and more, each with its unique health and beauty perks incorporated into the Natura product. So if you're in a bit of a beauty rut and looking to give a new brand a go, I highly recommend Natura. And even if you can't immediately a book a trip to Brazil, you can still shop all their products online, direct from your sofa. Happy shopping, fellow beauty lovers! Where to Shop Online: Choose your Country and you can shop in your currency. Delivery fees will apply. LIKE it, pin it, share it!